PIC: Tahlia Mossman and with her sailfish about to be released. Spring is in the air and the weather is heating up with some hot days already starting to kick in. This is a great time of year for walking the shoreline along the west side and seeing some amazing wildflowers on the trek. The air temperature is far more desirable for those dawn and dusk raids that can result in some productive captures. We recommend using poppers or stick baits in this low-light time where species such as spangled emperor, queenfish, trevally and giant herring can crash down on your choice of lure. The Woodpecker stick baits have been the hot favourite with the charter operators and the shore based anglers. Jack and Janelle Edwards from SA are on holidays and loving the fishing. They had a mate working in the RAF who advised them to come here for the amazing scenery and fishing. The pair drove the 9000km round trip and have been catching all sorts from the shore. The pair used squid for bait and fished the shoreline south of the marina. They caught all sorts of species including cod, tusk fish, flounder, lizard fish, blue lined emperor and a few bizarre unknown species. They released all that they caught, but are heading back to get in to the emperor again after discovering they are great eating and were size for keeping. An excited crew of 12 guys headed to the Monte Bellow Islands for a fishing trip this week. The men enjoyed the hospitality of the local restaurants and shops prior to their trip and grabbed a few essentials from the tackle shop before leaving including fishing gloves, buffs, lures and a comfy bean bag. Bean bags on boats are insanely good. We have used them for toddlers to get a good daily sleep or anglers feeling a bit green or tired. 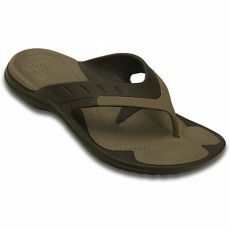 They are awesome for people with aches and pains or in rough weather. The fly fishing has been picking up this last week, especially since we reported on the spanish mackerel caught off the tip of the cape last week. Katie Knick who is here specifically for the fishing for 12 months from the USA caught one of these too and is pumped. Katie’s partner has also joined her on her journey to explore the waters of Exmouth for fly fishing and they have made some great memories. 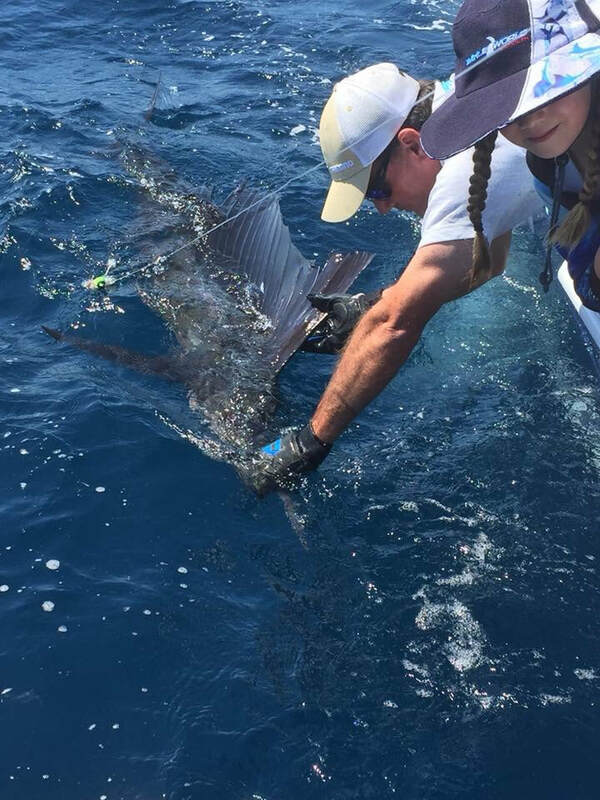 The juniors have been getting in to some practise for the upcoming national billfish tournament and Tahlia Mossman tagged a sailfish on Sunday in magic weather. Kids fishing this event will have a blast and we are excited to help the kids learn more about boating, the ocean, the billfish, team work and the tagging programs that the game fishing club participate in. 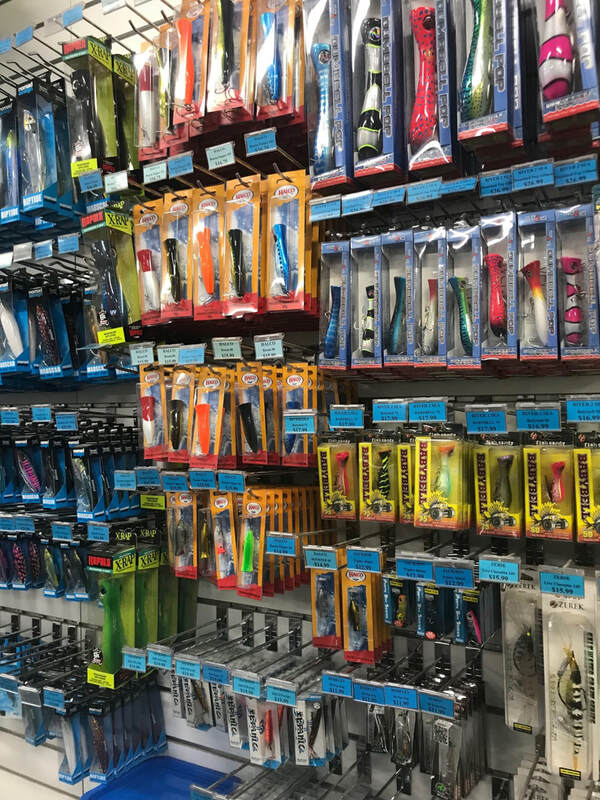 Massive range of poppers instore from small models for whiting up to large ones for GT's including the custom made Black Ledge Lures. See in -store for further details. PIC: Ben Patrick with a Chinamanfish. 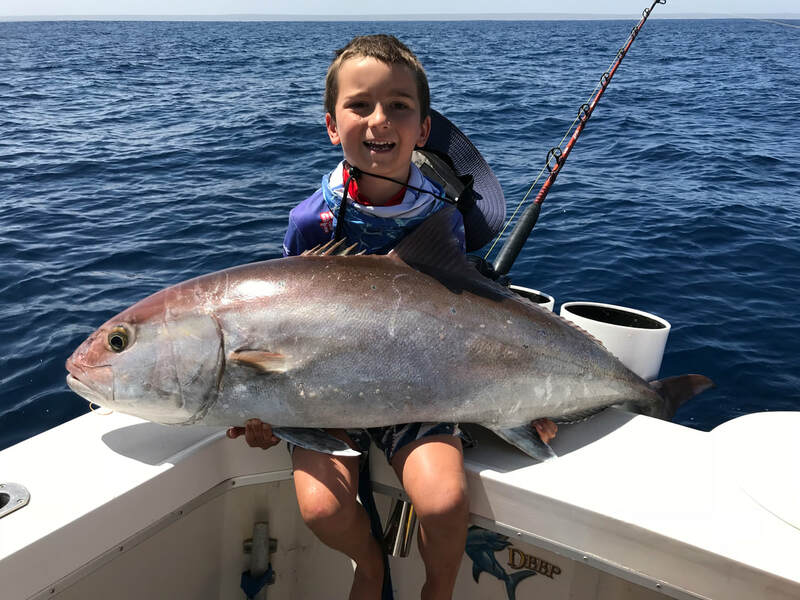 The excitement is building for the lead up to the school holidays and Australian Junior Billfish Tournament, as kids and parents gather to compete in this national event. The forecast is looking good for the Saturday and Sunday. Monday may be fished if the weather is better than the weekend, as it is determined on the briefing night which two days are best out of three for fishing. Some parents are from town and have been out having a practise, while others are arriving from Perth early to get in a few days prior to the event. Three guys from Zimbabwe flew in for a fishing charter and managed to get mackerel, wahoo, sailfish and black marlin. The sails have been showing up in pods west of the lighthouse, while the blacks have been further south. The mackerel have been to the north and around the islands in the gulf. Hard bodied lures, in particular the stick baits have been working the best for the mackies while casting, while trolled bibbed and non-bibbed minnows have also been hot. The new Max 200 that can be trolled at 20knots is a definite winner for people wishing to cover ground while searching for reef spots. A film crew from the USA were here with the Halco crew this week. They tested the new Max range and got in to some wicked fish including chinaman, gt’s, mackerel, wahoo and tuna. Pictured this week is one of the spectacular fish caught on lures. The guys were blown away with the fishing here that is some of the best in the world according to their experience. The shore fishing has been productive this week with reports of the usual bread and butter species in the gulf like whiting, flathead and bream. The west side has been a bit quiet, but no doubt we will get some better stats as the school holidays hit. Make sure you have all your safety gear up to date as the DOT will be doing checks on boats to ensure you are safe on the water. 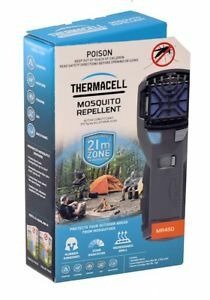 Keep your camp area free from mozzies and midgies! Try a Thermocell on your next camping adventure. PIC: Lochlan Turrell with his Dad and black marlin. The Australian Junior Billfish Tournament was blessed with sensational calm weather for the 25 kids and 35+ parents that participated. Jack White was the first junior to tag a billfish, with a black marlin tagged on day one. This was the first marlin for 9yr old Jack. Some of the youngest anglers in the fleet aged just 4 were on board and helped cheer Jack on to work as a team and get the fish to the boat on his own and tag it for the event. There were more billfish encountered on the second day with some incredible angling including two black marlin estimated at 80kg each that were caught on 15kg line by brothers Declan and Jaxon Kabelka aboard Sin Bin. 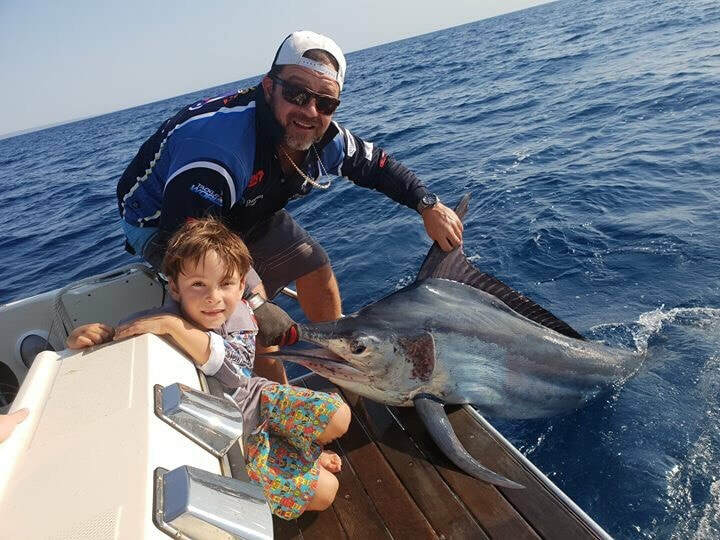 Young 5yr old Harvey Mitchell caught a sailfish for the first time in a tournament, while Lochlan Turrell did an amazing effort with a 60kg black marlin on 10kg line. Champion Skipper was taken out by Scott Turrel, while Champion Team Junior was won by Team Kajiki, Champion Team Mixed was won by Sea Trix and Champion Team Small fry was won by Team Evolution. The clubhouse was full of kids, proud parents and big smiles with every child taking home a tournament shirt and prize of some sort for being a part of the team. Some great memories were made over a weekend that will continue annually, so get your calendar out and mark it in for 2019. The school holiday makers are here and kids are keen to get out and wet a line. The weather has started brilliantly, but there will be a few windy days to contend with through the two week period. The new King Reef is a winner with anglers and divers wanting to get out there and see what it has attracted. People have been using bait jigs on the jig rods and getting some small scad and butteries. Others have been diving it and seeing the fish it has attracted already including juvenile red emperor, cod, spangled emperor and more. Queenfish have been thick in the gulf and the fly fishing anglers have been more excited than ever with schools hunting down the flies presented. A fast retrieve is best for these fish and a blue clouser seems to work best. The anglers who are on conventional gear are finding the Woodpecker stick baits to work the best. We recommend crushing the barbs on hooks and using single hooks for these fish if you are using lures, as the release is far better for the fish. There are plenty there, so make sure you release them well. If you are not sure what is biting where, drop in to the tackle store to ask, as we get people in every day reporting and our staff are out fishing on their days off and we are happy to help you have success and look after the fish in our back yard. 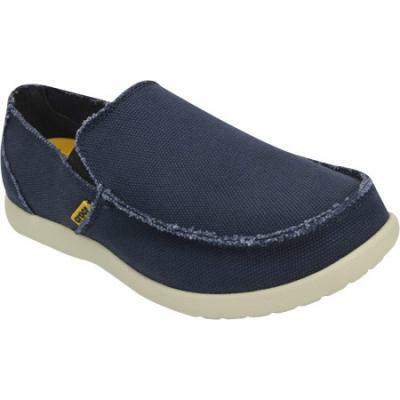 Crocs shoes, including thongs, mens casual shoes and women's high heels!! We have a large range and can get the style you want if we don't have it. PIC: Matt Gates with a crackin' bluey. The school holidays have been one of the busiest yet for this time of year, with families descending on Exmouth for some warm weather and fun times. Fishing has been on the agenda for lots of kids, with eager parents willing to get the youngsters out on the water rather than infront of screens. 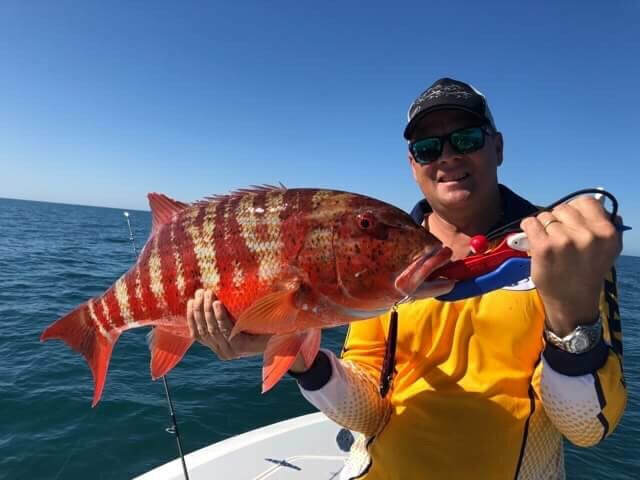 The first week of school holidays was a little quiet for Exmouth’s fishing standards with many people reporting fantastic weather, but slow bites. There were acres and acres of bait in the gulf which usually get seriously harassed by predatory fish, but only a small amount of sailfish were seen by several boats. The birds were showing signs of sailfish, but the majority of pods seem to have been further north with crews in Dampier and off Barrow Island reporting large numbers. We expect these sailfish to turn up any day now and already today there are reports of pods smashing teasers, so it’s all about to fire up. 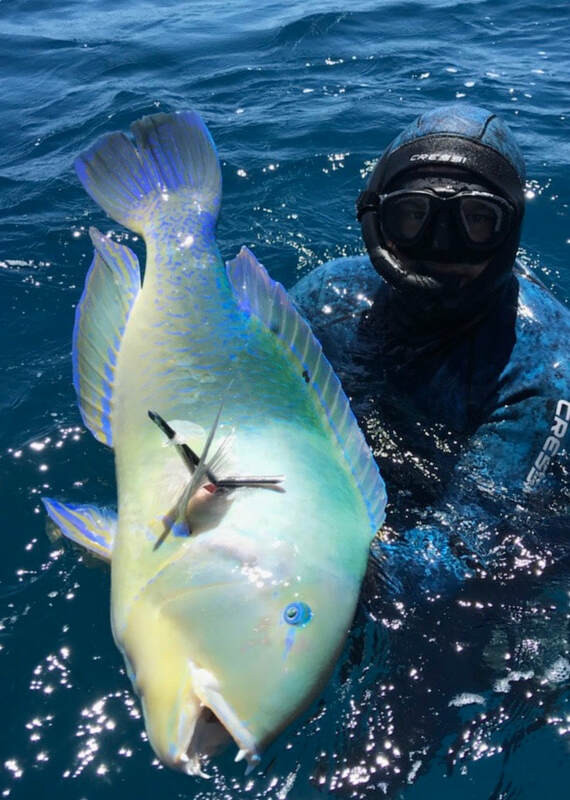 The guys targeting reef fish have not been disappointed in the start to the second week of holidays with reports of red emperor, rankin cod and ruby job fish by several customers. The mackerel have been abundant too and surprisingly, not as many sharks have been encountered. Cobia have been showing up in numbers too in the last few days, while a massive tiger shark was seen on the shoals in the gulf close to the marina by visiting anglers from Dampier, the Grasso’s. The estimated 200kg+ agitated tiger was circling the boat several times while the kids were catching some blue lined emperor. The crew decided to move away from the area and continued to fish elsewhere. Interestingly, the same crew fishing with the Grasso’s have seen massive tiger sharks in the upper gulf, lower gulf, west side and around the islands in 7 from 10 days of fishing and snorkelling. It would be interesting to see some satellite tag movements of these sharks. The whiting have been showing up in the last two days on town beach in large numbers. This is a fantastic place to take the kids for an easy fish on even ground and close to town. All you will need is some light gear, small long shank hooks, light sinkers and prawn for bait. The red beads can help too, along with some berley. We highly recommend having polarised sunglasses to ensure you can see the fish schools as they cruise along the shoreline. High tide is the best time as well and these fish are very easy for kids to catch, handle and eat. It is great to teach kids where their food comes from and how to respect it and the environment. Not to mention the appreciation of the fresh seafood we have available in Exmouth. Of course, there are many other aspects of fishing that is so valuable including family bonding, team work, peace (hahaha, not always with screaming excited kids?!) and so much more. Did you know it is National Gone Fishing Day on October 14? Yes, a whole day dedicated to fishing, so if you haven’t been out for a while, make sure you make the effort to get out on this day and enjoy what so many others do across Australia. Great options for keeping the sun off without using heaps of sunscreen! 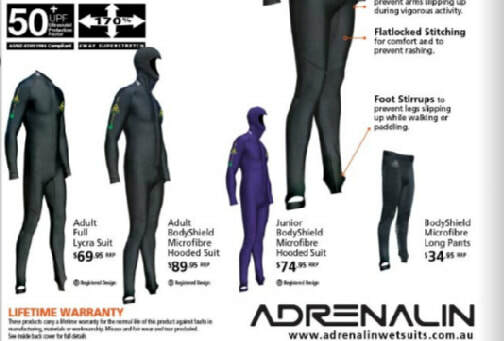 Awesome for kids or adults. ​PIC: Kalvin Gates with the amber jack caught and returned in deep water. The September school holidays were some of the best yet with unbelievably good weather and perfectly warm conditions for families that chose the great option of Exmouth for their destination. The fishing was rather quiet though in many areas, but it only takes one good fish on a day to help forget the hours of waiting for bites. This is just what happened onboard In Deep with four kids trolling for pelagic fish on the west side. The crew had been reef fishing as well and had only a few decent bites until one cracker amber jack took the blue mackerel bait. Young Kalvin Gates was the angler who (with the help of the electric) managed to land the fish from deep water. These species are very hardy and return well to deep water. A ruby came up from this deep water too and fell off at the waterline, but aptly turned and swam back down. The next day the crew decided to troll from Tantabiddi to the marina via the contours between 50-150m for mahi mahi, marlin and sailfish. The youngest angler, Dean Gates (4yrs) had his tuna Christmas Tree lure out as they passed one of the football field sized schools on the way. He hooked up and began bringing the striped tuna to the boat when a black marlin snavelled it and began jumping all over the ocean. Dean managed to stay connected for some time and the marlin was tagged, with his brother (6yrs) helping to film it and helping land it after the tagging. The hours of waiting were soon forgotten with this incredible fish and is a story that will be told for years. The whiting fishing has continued in the gulf with the Mossman family getting in to some honkers on the turn of the low tide using prawns for bait. They managed to also land some small tusk fish that were returned, but the dozen whiting made for a great fresh fish dinner for the visiting grandparents. We usually recommend high tide for whiting, but in this case the low tide was good too! If you drive along the beaches in the gulf, you will see the schools, which are quite thick at present. A few for a fresh feed is best and for some excitement on light gear we recommend using small poppers that the whiting love. The big blue marlin are starting to show up in the billfish scene. Charter operators are getting people come from all over the world to the great fishery we have here for billfish. The sailfish have also started in the gulf and the acres of bait schools located in this area are sure to attract many other species for the visiting angler. Of course, the Billfish Bonanza is on in a few weeks and this event is a great start to any newcomer to billfishing. It is an easy 3day tag and release event where you can target the sails in the gulf or marlin west side. Some great prizes are on offer, along with sections for newcomers, juniors and small-fry (under 11). Get your entries in early and if you have any questions, do not hesitate to ask us in store on the ‘how to’ and ‘’where to’ for this great event. This coming Sunday, October 14 is National Gone Fishing Day!!! Hooray, a day especially dedicated to fishing and highlighting the benefits of recreational fishing to individuals and families. Tackle World Exmouth are offering some specials for anglers on Saturday in preparation for Sunday and on Sunday for the National day including discounts and extra specials for local VIP members. There will be cast net demonstrations, and complimentary drinks organised with smoked fish samples. Get yourself in to fishing, it’s great. We have a huge range. Come in and see us today to help you see the fish better in the water!